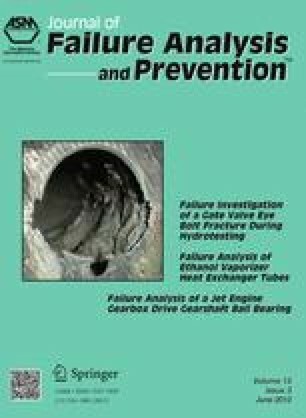 This study presents the results of failure analysis of a 28 MW gas turbine at the Rei electrical power plant. The gas turbine failed during the shutdown period and near its second natural frequency at 4200 rpm. Initial inspections revealed that the compressor disk of stage 15 was fractured, and all of the stationary and rotary blades of stages 14–18 of the compressor had been detached or broken from the dovetail region of the disks. The fracture roots were investigated by performing finite element modeling and fractography analysis. It was shown that a crack was initiated from the disk edge on its interface with the rotor shaft and was propagated under cyclic loading. As a result of the malfunction of the compressor bleed valves, which led to compressor surge, the amplitude of vibration of the turbine rotor increased under aerodynamically induced forces. This increase in the natural frequency of the turbine, near the second natural frequency of the turbine, led to final ductile fracture of the compressor disk of stage 15. Finally, the turbine rotor stopped with the loud noise produced by the direct shearing of the fractured disk on the stator casing. Some recommendations are proposed to prevent similar failures in the future.